Those of you who work from home know that it can be a wonderful blessing. But there are also many things that can be hard, too. It’s easier to be distracted at home and harder to stay focused and disciplined. I’ve been working from home since 2005 and I’ve learned a lot through trial and error. There are times when I’ve really struggled with my time management, but as a result of those struggles, I’ve learned a lot that has helped me to be much more efficient and productive. A few years ago, I set up a time budget for my daily activities. This has been revolutionary for me! When I first switched to using a time budget, I adhered to the same daily time budget for my work-at-home hours (45 minutes on this, 10 minutes on this, 15 minutes on this, etc.). However, in recent months, I’ve shifted to writing out a time budget plan for each new day. I include everything on this plan — from showering to making dinner to homeschooling to work projects. I try to cover all of the bases and leave 2 hours of margin time for those inevitable interruptions. This might seem like a lot of work, but because each day is different and there are different project deadlines and must-do’s that vary with each day, this helps me to be able to stay organized and manage my time well — all while being flexible. After creating the time budget plan for each day, I take it a step further and prioritize my work/blogging time. I’ve found that if I don’t have a prioritized plan for what I need to do, I can quickly spend a few hours just putting out fires. Instead of just saying, “I’m going to spend four hours on computer and blogging work each day,” I write down exactly what I plan to do during that time in prioritized order. If I know I need to do A then B then C then D, it keeps me on task and it guarantees that I actually accomplish the most important priorities. If you’re interested in hearing more how this works for me, watch my video on How I Do It All — Or Not. I know, I know! Multi-tasking can seem like a very efficient way to do many things. However, when it comes to most most work tasks, if you want to get concentrated work done in an efficient manner, you need to shut out all the noise and just focus on one thing at a time. If it’s your time to email, work on emailing. Go through your emails in order of priority and don’t stop until your time is up. If it’s your time to research something, only work on researching that thing. If you need to make a phone call, just make the phone call. If you’re used to trying work on your computer while you have a bunch of applications open and with your phone constantly dinging at you, you’ll likely be surprised at just how much work you can get done in a distraction-free 20-30-minute concentrated block of time. And once you get in the habit of doing one thing at a time, you’ll learn where your fizzle out point is. This is the point when you need to stop and take a break or stop for the day in order to come back to your project refreshed and energized. Personally, I’ve found that I do best by working in 20-30 minute blocks and then rewarding myself with a short 5-minute break to check email or read something online. If I’m working on an in-depth project that requires a lot of brain power, I’ll often set the timer for 20 minutes and work on it and then set the timer for 15 minutes and work on a cleaning project or play with the kids. I shoot to have no more than 5 emails in my inbox at all times. This might sound crazy, but it’s one huge way that I stay organized and efficient as a business owner. If an email only require a quick response, I respond immediately. If no response is necessary, I archive the email. If an email can be handled by someone else on my team, I forward it onto the appropriate team member. Want more help with keeping your inbox under control? Read my extensive post on How I Keep My Inbox to Fewer Than 5 Emails. I used to think that burning the midnight oil would make me more productive, but I’ve actually found that I’m much more productive if I get at least seven hours of sleep almost every single night. I usually am most productive in the mornings so I make it my goal to go to bed by 10 p.m. and get up between 5 and 6 a.m.
It’s hard for me to shut things down at night but I’ve found that I’m much more prone to dawdle and waste time at night than I am in the mornings. You might be the other way around. Do what works best for you, but whatever you do, put getting enough rest high up on your priority list. You’ll feel better and more energetic and I’d wager to guess that you’ll also find an extra hour or two of sleep at night helps you to be more productive than if you spent that time trying to pry your eyeballs open with toothpicks and get more work done. As women, we’re often afraid to say no. We fear we might miss out on a big opportunity and we worry about what other people might think of us. I know, because I’m there a lot. I just want to encourage you (and myself!) to guiltlessly say “no”. If an opportunity is going to require time you don’t have or going to oblige you in a way you don’t feel comfortable with or is just not a good fit for you, your family, and/or your business, say “no”. Before committing to anything, count the costs. What are you going to have to give up in order to do this thing or attend this event or write this post or participate in this project? Is it worth what you’re giving up? If you’re not 100% sure that it is, then say “no”. Are you a work-at-home woman? If so, what are a few of your best time management tips? This post was underwritten by Blogelina.com. Did you know that it really is possible to earn an income from blogging at home? Even as a busy mom of little ones? In her online class at Blogelina.com, Tanya (a stay-at-home mom of three little ones herself) shares the ins and outs of how to set up and maintain a successful, profitable blog. Money Saving Mom® readers get to take the popular 4-week Profitable Blogging Class, along with all the bonuses, for just $5! Use the promo code MSMOM at checkout by December 17, 2013. Sign up today! Thanks so much for this post! I’m having a difficult time managing homeschool, work and house cleaning. I wonder how others do it and if they hire a babysitter. I know that’s a route I could take, but I’d rather spend time with my kids than have a babysitter. Melissa–I’ve freelanced from home since January 2004. Had my first child in November 2004 and then two more since. One of my biggest pieces of “advice” for work at home moms is you have to have a support system to make it all work. For me, when my youngest was 6 weeks old or so, my mom began coming to care for her one day a week while I worked in my office upstairs. Now, nearly 9 years later, she is still coming. My two oldest are now in school full days and my third is in preschool every morning but my mom picks him up one day a week and then stays until dinnertime, overseeing homework, etc. Having that one day I know I can count on for several hours of uninterrupted work has been a huge blessing and my kids have loved that time with my mom. I also am blessed to have a very supportive husband. For many years, he took over as soon as he came home from work a few days a week so I could get in several hours of work. I’ve also had a season where I worked several hours on Saturday mornings. My schedule looks a little different now that the kids are older but my husband and my mom still play a major part. The schedule has changed numerous times as the needs of my family have changed but having set concentrated work times has made all the difference. I still have had a lot to do outside those “set” hours but knowing I could really focus during those times has been a lifesaver. I don’t know your specific situation and if its possible for family to help, but if not, I would encourage you to consider hiring a sitter, even if it’s just for a few hours a couple of times a week. Knowing you have that uninterrupted time will make a huge mental difference for you. And you’ll still have plenty of time with your kiddos :). I’ve loved being able to be home with my kids and while working from home has presented many challenges, it has been one of our biggest blessings. I work FT from home. I do not home school (I have twin girls in 2nd grade). When they were babies I had a nanny here while I worked, and eventually we evolved into PT preschool and PT nanny. Even still in the summer I hire childcare, although as they’ve gotten older it is much easier to manage the odd school days here and there without needing childcare. For weeks off (ie. Christmas or spring break) I usually send them to gymnastics camp one of the days and maybe have their sitter come one of the days. I have a house cleaner every other week. I could have never worked without childcare help when they were younger. I could probably swing it now as they can keep themselves occupied pretty well, but I like having someone here (or at a camp) to engage them so they don’t spend too much time on electronics. I like the article’s advice on just say ‘no’. I would have half the neighborhood here after school every day if I did not say no. People think I can be their free after school childcare until they get home from work! I am working!! Fabulous tips, Crystal! I haven’t mastered all of these things yet, but these are exactly the things that I strive for, so it’s good to know from someone I consider to be an expert, that I’m heading in the right direction 🙂 Thanks for sharing! I do a lot of multi-tasking in the kitchen and around the house, but I have learned that multi-tasking does not work at the computer. It is way too easy to get sidetracked. I think I need to get myself a handheld timer (as in not the one on my stove). I often set times for tasks, but don’t set an actual timer, just look at the clock. I think using a real timer would be very helpful. I use a hand held timer all the time! Mine broke recently and I have tried the one on the kitchen, and it is not the same! All I want for Christmas is a new timer but I probably should just go buy one because I am feeling lost without it! I am sure you understand! I kind of hinted to my husband today that a timer would be great to have… we’ll see if he picked up on it 🙂 He likes to surprise me, so I have to let him think of it by himself. If not, I’ll get myself one after Christmas. I just installed an extension on safari called waste no time. It allows me to block websites such as facebook while I am at work (working hours) or limit your usage to a defined amount of time. It’s my 1st day using it however I think it has helped me a lot since I find myself on FB/Twitter a lot. I asked for a timer for Christmas, not just for work and writing, but for household chores as well. I find I’m more productive with dishes, say, if I know the timer goes off in 15 minutes and I’m done. For writing, depending on the topic/type, I’ll try to beat a word count goal in that time. It helps me to concentrate. 🙂 I’ll be using these tips for sure, and thank you! I have a little note book on the counter and daily make a 3-4 item to do list. If I have more in my head that’s making me stressed I put what can be done the next day on the next page. If I hit today’s items I can look at getting a head start on tomorrow. But if the kids are all over me and I’ve accomplished today’s goals then I stop and give them attention. It helps me not overload myself or stress too much about all that’s left to do. It really helps me live in the moment! Using an actual timer is very helpful for me – when I remember to use it! I’ve been noticing recently that I waste a lot of time on “little things” that add up quickly. Using the timer helps, and I’m experimenting with grouping like tasks together and working on them in chunks. For example, writing several blog posts in one sitting, then scheduling corresponding social media promotion during another block of time. So far, so good! I get up for each day and “get ready” for work as I used to when I had an office job. Not necessarily in full business wear but a cute, comfortable outfit, makeup and breakfast. I also use a designated office space and refrain from turning on the television or radio when I am focused on specific tasks. I make a list as well, at the end of each workday, of each task I want to complete the following day in order of importance. I make sure I am off my computer when my work day has ended and then I begin to tackle my separate household goals. I arrange those according to the time I want to begin them. I try to prepare as much as possible in advance for my houshold tasks like pre-measuring my dinner ingredients and setting up an assembly line for each course or pre-sorting my laundry loads and placing them in a line near the washer. And as stated below: you can’t do it all alone! I’m learning to accept that things may not be done the way I would do them in the house or with kids but to appreciate the effort made in the assist! All of the above worked for me. Add a stop time for work exit the office and do not work until your next scheduled start time. Write down the tasks you think of for the next day. It is too easy to spend too much time working. Turn it on and off. I started homeschooling when my children were 8, 6, and 2 year old twins, one with Down Syndrome, the other recently diagnosed with Celiac Disease (this was 23 years ago!). I have always been fairly organized, but I read a book called “Side-tracked Home Executives” and it really helped bump up the level of organization. (It is still available on Amazon.) It was a system I followed for many years and it became a habit. One of the best eye-opening tips was timing how long each chore really takes. You may think it takes a lot longer than it does. For instance, if you know cleaning the bathroom really only takes 20 minutes instead of the hour you imagine in your mind, then when you have 20 minutes you can clean the bathroom. It uses a card system and it really was tremendously helpful. I had other time management books and tools, and I gleaned a little from each one. It helped keep our home somewhat orderly all through the busy homeschooling years (with many doctor and therapy appointments thrown in!) and I still use many of the organizational tools today, though it’s just my husband, my adult daughter with Down Syndrome and myself. If you still struggle with managing your home, don’t give up. There are multitudes of resources today; keep experimenting until you find what works for you! I was hoping those who didn’t work from home could find some helpful tips, too! My biggest problem was getting people, especially my husband, to understand that I may be home but I am at work. When I am in my sewing room I am at work. The house is on fire-let me know. You can’t find the peanut butter-not my problem, I am at work. Sorry Sue but I can’t talk on the phone with one of your hour long conversations about your life. One thing that has absolutely revolutionized my work day is KanbanFlow.com. It’s really meant to delegate work for teams, but I use it for my freelance work. It gives me an easy way to see everything that needs to be done for the month and lets me quickly identify what needs to be accomplished each day. But what I really love is that it uses a Pomodoro timer to keep me on track and super productive. In addition, since I am tracking my time, I can go back and see how long certain assignments take me. That information helps me determine if some jobs are worthwhile or how much time I need to allot for similar, future projects. There is a paid premium version of the site, but I just use the free version and that works great for me. I just signed up for the blogging class through blogelina. I am trying to get started blogging, but have so many questions and concerns holding me back. I think this is just what I need to take the plunge. Thanks so much! *Work on projects a chunk at a time. You rarely get hours to spend — and even when you do, there’s no guarantee that the writing will just flow during that period. Break these down into smaller pieces — a chapter, a post or even a sidebar. * If the words aren’t flowing, and the deadline isn’t imminent, go do something else for a little while. Keep thinking while you’re working — often, the logjam will resolve itself. *Make it easier by assigning yourself a variety of things to do. If the writing isn’t going well, then finish up the pattern instructions you were doing. If that isn’t going well, then finish up sales tax reports. Give your creativity leeway in several different directions; that makes it more likely that you’ll use your time productively. *Don’t be so disciplined. A new approach or idea often comes from wandering around for a bit. The trick is not to wander too much! Really good advice. This is something I have a problem with but keep trying to stay focused and keep moving forward. I love my clip to me timer. I use it when I substitute teach to stay on track with the different schedules. I love it at home as well. I have a 4 year old and a husband deploying in the New Year. Time to learn to manage time for the 4 yr and myself to get it all completed. Some great tips here, thank you! 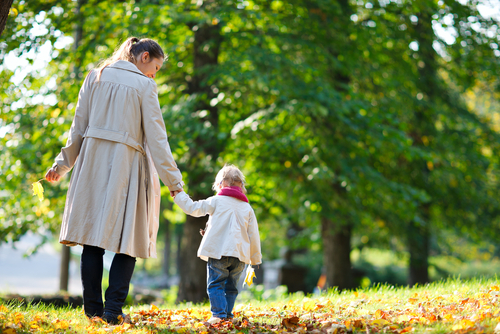 I became a WAHM this fall and am so blessed. I quickly learned the importance of balance (because I was imbalanced!) and am always learning how to manage my time. Rest, and not snoozing in the am, is what I’m working on lately! I have recently started working from both home and an office. I really appreciate this article and hope to incorporate these tips to my freelance work. This is my first time reading your blog and it is great. Do you have any tips on setting up a work space when you don’t have a dedicated office? That seems yo be my biggest problem right now since I live with 6 others, including my Mother and brother in-law. Good reminders! I am now shifting from having been employed at a company for 14.5 years, to unemployment starting in December, now to working from home on my own new business, plus some remote work. It’s been an enormous shift, and I really need to do the time budge. I’ve found that what’s helpful for me (am also a writer, and this helped me when I’d get lost in writing/editing a novel), is that I will set a timer–phone, microwave, stove–for a specified amount of time. That way my attention is drawn to the fact “time’s up” for what I need to do, or to take a break. I also “time budget” my day when possible. And alternate tasks between moving and sitting. More for my physical challenges that. A brain refresh but I imagine it helps both. As we are moving into working efficiently and actually devoting the time to make our blog successful I am searching for tips to improve my days. Thank you for sharing. 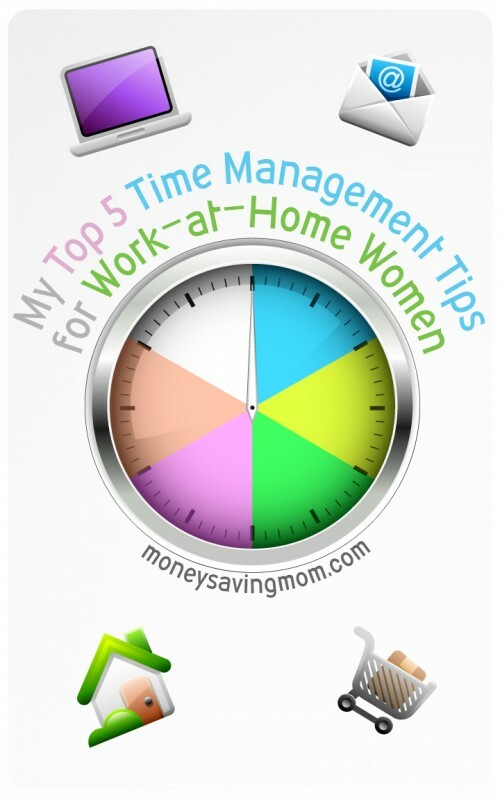 This article really helps me on how to manage my time at work and to my son. Thank you so much for posting this. Love these ideas. So practical and simple, yet so useful! Thank you! When I saw this in my Twitter feed I came over to read it. Wow, 2013, but so very timely no matter when it’s read. This was written in 2013 and it still applies perfectly to me today! The first point “Create a Prioritized List” is my weak point. I need to do this more often. My husband tells me all the time “make a list” and over the last few years, I have begun to do it more and it really does help. Thank you for reminding me and for this great post! Such a fantastic short and simple list! I definitely need to get better about prioritizing sleep and taming the email monster! Next stop is your post on dealing with emails immediately. As always, thanks for the great post, Crystal!